We are so excited at the workshop this week because one of our projects (Vintage Train Station Box) have been featured by the Creatively Living Blog and the A Delightsome life. It is our first two features and as newbies in the blog world, it means a lot and it inspire us to continue working & sharing beautiful projects. Thank you very much to Katie from Creatively Living & click here to see her party and the projects she featured this week. Thank you so much as well to Kathy from A Delightsome life & click here to see her party. Today I want to share this beautiful portrait, painted by Jacques-Louis David, a famous French artist of the neoclassical style. 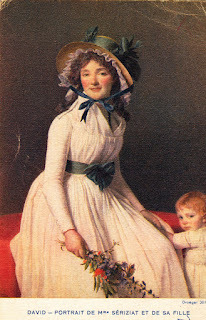 The portrait is of Madamme Emile Sereziat, who was his sister in law and he painted it 1795. I got this copy as a postcard, the original is at the Louvre Museum in Paris, France. According to Wikipedia, on a fashion note, her dress shows the beginning of neo-classical trends in women's attire. Congratulations on your first feature! You deserve it, that vintage train box is beautiful! Congratulations on having your beautiful box featured!